BRIER BOUND – (Right) Skip Thomas Scoffin releases a rock during the Yukon Men’s Curling Championship final Sunday afternoon against Jon Solberg and his rink. (Left) Solberg looks down the sheet as he takes a shot during the final. Scoffin’s rink won 8-5 to represent the Yukon at the Brier. 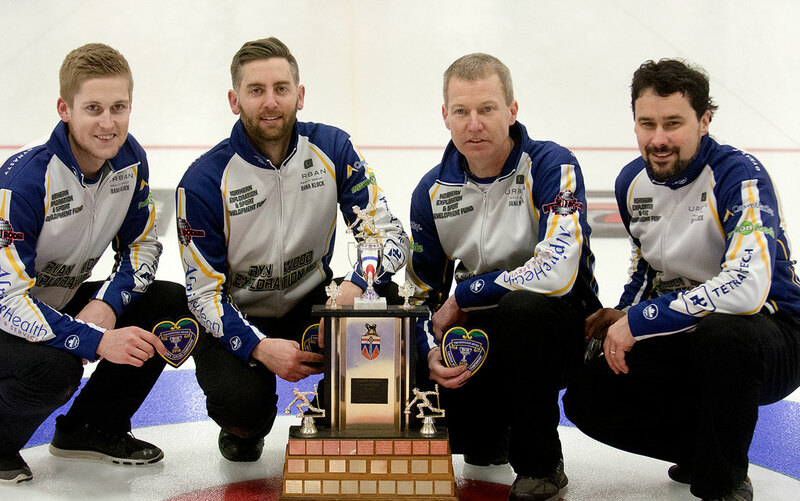 Thomas Scoffin, Tom Appelman, Wade Scoffin and Steve Fecteau, left-right, pose with the championship trophy after they booked their ticket to Regina. Name the curling event and Thomas Scoffin has probably represented the Yukon in it. Name the curling event and Thomas Scoffin has probably represented the Yukon in it. He has participated in six Canadian Junior Curling Championships for the Yukon starting at 12 years old. He represented the territory at three Arctic Winter Games winning one gold and two silvers. He skipped at two Canada Winter Games for the territory and also won bronze for Canada at the Winter Youth Olympics as the skip. And now the 23-year-old Whitehorse curler will be adding the Brier to his list of accolades as he skipped his team to an 8-5 victory over defending Yukon champion Jon Solberg Sunday afternoon at the Whitehorse Curling Club. Scoffin and his team consisting of third Tom Appelman from Alberta, Scoffin’s father Wade Scoffin at second and lead Steve Fecteau went undefeated in their final five games of competition Saturday and Sunday where they could have been eliminated with one loss. In the six-team tournament, Team Scoffin lost in their first game of the tournament Thursday against Tyler Williams 4-3, with Bob Smallwood winning the day’s bracket to advance to Sunday play automatically. Scoffin lost again on Friday against Solberg 6-5 and had to win their remaining games for a shot at the championship. And that is what they did. They faced the two top teams heading into Saturday’s play beating Smallwood 8-2 and then Solberg 8-1 to clinch a semifinal berth on Sunday morning against Smallwood, who has previously represented the Yukon at the Brier, and his team. The streak continued for Team Scoffin winning 8-4 to clinch a rubber match with Solberg and his team of Craig Kochan, Dustin Mikkelsen, Brandon Hagen and Ray Mikkelsen. It was a slow start for the Scoffin team starting with the hammer in the first end and blanking the end to keep the hammer in the second. A few mishits in the second forced a steal for Solberg. Keeping the hammer all the way into the fourth end, Scoffin was poised to score some points with several rocks in the house heading into his two shots. Scoffin’s last shot cleared the house of all but one opposing stone leading to a score of five and a 5-1 lead heading into the fifth end. Scoffin’s team went on to win the game 8-5. “That end, I didn’t expect it to shape up the way it did. We had a few biters hanging on that ended up being extra points,” Scoffin said on the game-changing fourth end. “Going into the last shot I had just thrown a similar shot on my first one so I had a good idea on what the ice was going to do and I just had to throw it good and make it. This will be the first time the territory will have its own representation in the full Brier competition after the pre-qualifying tournament for a spot in the main draw. Previously to the qualifying tournament, the Yukon and Northwest Territories represented with one team and had to have a playdown between the two territories for the spot. In the three years of the pre-qualifying round, the Yukon never made it into the main draw but made it to the final game twice. Smallwood’s rink fell in 2015 in extra ends and Solberg lost in the 2017 final 9-6. “It’s just really exciting and we can’t wait to represent the Yukon and hopefully do them proud and we’re going to work hard to compete well in the future,” Scoffin said. Solberg’s team had three returning players from last year’s winning team that won on the last rock in the 10th end to clinch the Yukon title against skip Brent Pierce and his team which included both Wade Scoffin and Fecteau. Wade Scoffin has been to the Brier before and competed in four Yukon championships in a row losing the previous two before this victory with his son at skip. “It’s a dream come true. To be at my first Brier with my dad is pretty special and I can’t wait for that,” Thomas Scoffin said. The final game was played in front of a packed crowd watching from above at the curling club eager to see which team will be taking the title. Maintaing the lead into the final end, Scoffin’s team was up 8-5 with the hammer and Solberg needed a steal of three to force an extra end. Putting rocks in the house early, they put the pressure on but Team Scoffin was able to stay composed under pressure and peeling the rocks at the top of the house until Solberg’s team ran out of rocks. With two Solberg rocks sitting in the house and only one shot left, Scoffin had the chance to end it on his first rock by removing one of the opposing rocks and he did just that to seal the victory. It was immediate celebration for the newly-formed team and family members with Fecteau quickly being grabbed by his two young kids. With Thomas Scoffin previously away at school in Edmonton at the University of Alberta, he said this team was recently formed and it is their first season together as a unit. “We’re pretty fresh. We’ve played a few spiels together but we’re definitely still finding our rhythm and finding our groove,” he said. This was the first step for the new team, Scoffin said, and now that they are the territory representatives they will be having training camps and practising regularly to get ready for the Brier starting March 3 in Regina, Sask. “This was our first step and obviously if we don’t make it the road ends here, so now we got some plans. We’re going to be working hard to be prepared, doing some training camps and doing everything we can to be ready for the Brier,” Scoffin said.